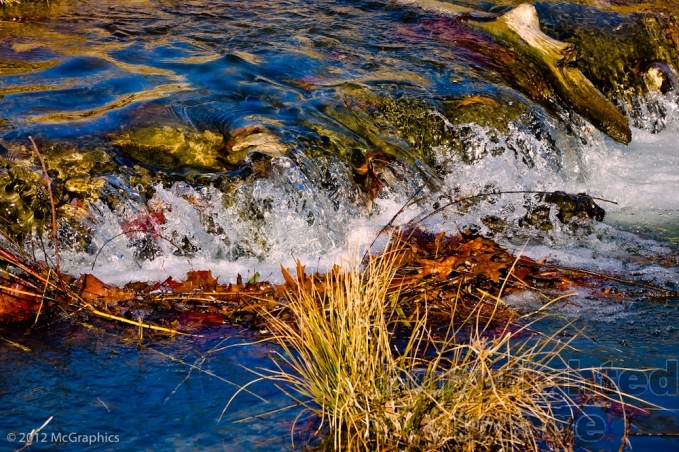 Forest Park is a public park located in western part of the city of St. Louis, Missouri. It is a prominent civic center and covers 1,293-acre (5,230,000 m2). The park, which opened in 1876 more than a decade after its proposal, has hosted several significant events, including the Louisiana Purchase Exposition of 1904 and the 1904 Summer Olympics. Bounded by Skinker Boulevard, Lindell Boulevard, Kingshighway Boulevard, and Oakland Avenue, the park is known as the “heart of St. Louis” and features a variety of attractions, including the St. Louis Zoo, the Saint Louis Art Museum, the Missouri History Museum, and the St. Louis Science Center. In 1901, Forest Park was selected as the location of the 1904 World’s Fair, known as the Louisiana Purchase Exposition. The fair opened April 30, 1904 and closed December 1, 1904, and it left the park vastly different. In addition to the fair, the park hosted the diving, swimming, and water polo events for the 1904 Summer Olympics. Though there were a total of fifteen sports to compete in, the only sport women were allowed to participate in was archery. However, large steps were made for minorities as this was the first time that African Americans were allowed to compete in the Games. The fair’s landscape architect, George Kessler, dramatically changed the park: the wetlands areas in the western part of the park were drained and converted into water features and five connected lakes. Sewer and water lines that were installed during the fair remained for public use in the park, and after the fair, thousands of trees were planted and vistas were created. In 1909, the fair’s directors gave the balance of the remaining profits from the fair toward the construction of a monument to Thomas Jefferson, which when completed in 1913 became the Missouri History Museum building. Other structures left from the fair include the Saint Louis Art Museum, the Apotheosis of St. Louis (a statue of French King Louis IX), the World’s Fair Pavilion, and the 1904 Bird Cage. The Palace of the Arts, a building now known as The Saint Louis Art Museum in Forest Park, was divided into six classifications: painting, etchings and engravings, sculpture, architecture, loan collection, and industrial art. In addition to art displays, many novelties were showcased for the first time at the Fair. Electricity, still considered young at the time, was showcased in a number of ways. Attendees at the Fair were awestruck by the electric lighting, both inside and out, of all of the important buildings and roads. The electrical plug and the wall outlet were also displayed. Two of the more notable technological achievements demonstrated were the x-ray machine and the baby incubator. Forest Park has many features for visitors to enjoy. The most visited feature of the park is the St. Louis Zoo, a free zoo that opened in 1910. In 2010, the zoo attracted 2.9 million visitors to its collection of more than 18,000 animals. The zoo is divided into five animal zones: the River’s Edge, which includes elephants, cheetahs, and hyenas; The Wild, which includes penguins, bears, and great apes; Discovery Zone, which includes a petting zoo; Red Rocks, which features lions, tigers, and other big cats; and the oldest part of the zoo, Historic Hill, which features the 1904 Flight Cage, a herpetarium, and primate house. A sixth zoo zone, known as Lakeside Crossing, features several dining and retail options. For animal care, the zoo also features a veterinary hospital and animal nutrition center. The St. Louis Science Center, located across Interstate 64 on the southern edge of Forest Park, received slightly more than 1 million visitors in 2010. Part of the science center, the McDonnell Planetarium, is located within the park and is connected to the main building by an enclosed footbridge. In addition to the Orthwein StarBay planetarium show featuring more than 9,000 stars on an 80-foot (24 m) ceiling, the facility offers exhibits about living in space and hosts monthly public stargazingevents in conjunction with the St. Louis Astronomical Society. The Saint Louis Art Museum, which opened as the Palace of Fine Arts as part of the Louisiana Purchase Exposition, is located in the only permanent structure built for the fair. The building, designed by Cass Gilbert, houses a comprehensive art museum with particular depth in Oceanic art, Pre-Columbian art, ancient Chinese bronzes, and 20th-century German art. The museum began an expansion and renovation project in January 2010 under the direction of architect David Chipperfield. The construction will relocate surface parking underneath the addition and create a new lower-level gallery, with a total of more than 200,000 square feet of new building area. The Muny, officially known as the Municipal Theatre Association of St. Louis, has operated in Forest Park since 1916. The first production, As You Like It by William Shakespeare, predated the current building by one year; as part of an advertising convention St. Louis constructed the Municipal Theatre in 1917. Starting in 1919, the Muny was incorporated, and more than 1,500 seats in the 11,000-seat amphitheater were reserved as permanently free. The Jewel Box, an art deco greenhouse, operates as an event venue and horticultural facility. The building has nearly 7,500 square feet of display space and is 55 feet high, and it was built in 1936 using funds from the Works Progress Administration. The Jewel Box was added to the National Register of Historic Places in 2000, and in 2002, the Jewel Box underwent a $3.5 million renovation, which included the removal and reinstallation of interior plantings, upgrades to the heating and air conditioning systems, and modifications to allow the building to be used for catered events. The Dwight Davis Tennis Center is a tennis facility with 19 lighted tennis courts and a clubhouse, named after St. Louis tennis player Dwight Davis. The facility offers tennis training programs, sponsors tournaments, and is home to the St. Louis Aces, a local tennis singles team, who play in the 1,100-seat Stadium Court. In 2006 and 2007, several courts were refinished, while new shade awnings and benches were provided for players and spectators. The Boathouse at Forest Park is both a restaurant and boat rental facility. Since the opening of Forest Park in 1876, boating has been an activity in the park; in 1894, the St. Louis Post Dispatch paid more than 6,000 workers to expand one of the lakes in the park. In the early 2000s, a new boathouse opened with access to both Post-Dispatch Lake and the Grand Basin at the foot of Art Hill. The boathouse, open year round, offers paddle boat rentals and was designed by St. Louis architect Laurent Torno in the style of early 20th century Midwestern boathouse cottages. 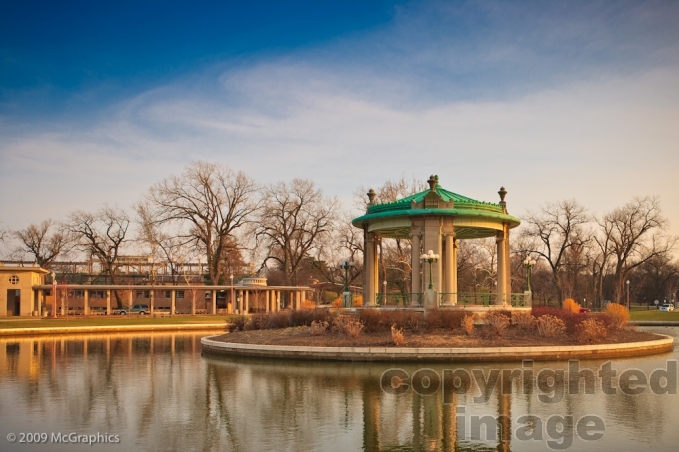 The gazebo in front of the Muny is one most popular searches I get on my gallery site. Here is the story about it. 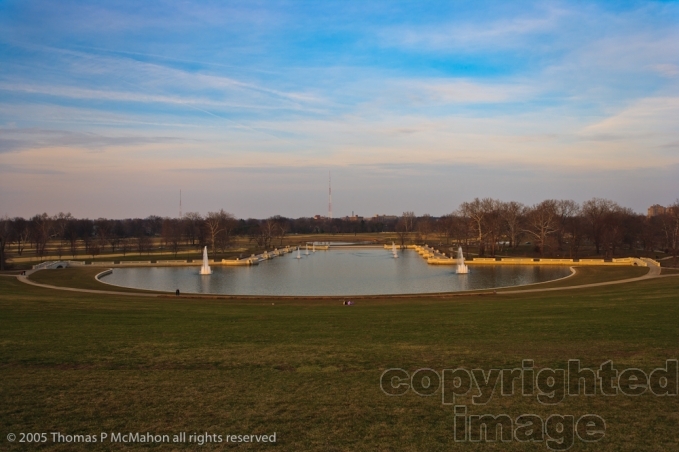 Pagoda Circle, located in front of the Muny, is a circular drive located around a lake with an island. On the island is the Nathan Frank Bandstand, which was built using funds donated by local businessman Nathan Frank in 1926. The bandstand, in the classical style, replaced an earlier structure with Asian motifs. In the early 2000s, the landscaping of the area was restored by the Flora Conservancy and the St. Louis Parks Department to a design by Oehme, van Sweden and Associates, and more than 27,000 perennial flowers were planted in the area. The Steinberg Skating Rink opened in November 1957 after a donation by the Steinberg Charitable Trust. Etta Steinberg, the wife of Mark C. Steinberg, gave more than $600,000 toward the $935,000 cost of the rink. The rink is open for ice skating during the winter and sand volleyball during the summer, and a dining and concession area, known as the Snowflake Cafe, offers American cuisine. During the early 2000s, the rink underwent a $1.4 million renovation that included a new rink surface, an ice-making system, and a new light and sound system. In addition, the parking lot for the rink was moved from the north end of the facility to the south end. A wetlands and prairie river area replaced the north parking lot, providing a walking path and birdwatching area. Located on Government Hill, the World’s Fair Pavilion opened in 1910 as a gift from the Louisiana Purchase Exposition Committee as part of their promise to restore the park after the 1904 World’s Fair. Designed by English architect Henry Wright, the original cost to build the pavilion was $35,000. In the early 2000s, the building underwent a $1.1 million restoration with the addition of new restrooms and a catering kitchen. In addition, the eastern archways of the building were removed (thereby opening the building to its original state), new lighting was installed, and the twin towers of the building were reconstructed.